Silence may be golden, but here in Oakland, we like a little more bass in our evenings. Oakland&apos;s music scene kicks it up with a large population of musicians; Kehlani, Mistah F.A.B., Too $hort, -- that have a variety of venues to play at, from stages that are merely a section of the bar floor to those places where the band is on a pedestal and the velvet curtains part. Headlining bands get full attention at the Oakland Fox Theater, performing against its Middle Eastern-influenced backdrop. Originally opened in 1928, the theater has hosted numerous concerts by artists such as Alice in Chains, Atoms for Peace, Black Star, Widespread Panic, The Decemberists, and Green Day since re-opening in 2009 as a live concert venue, after a $91 million renovation. Home of the Golden State Warriors NBA basketball team Oracle Arena is Northern California’s premiere sports and entertainment venue! The Oracle Arena is easily accessible by both highway and public transportation and is complete with a pedestrian bridge which allows guests direct access to the venues from the Coliseum BART station. The stunning art deco Paramount Theatre originally opened in 1931 as a “Movie Palace”. Following a full and authentic restoration in 1972, the theatre has hosted many concerts by artists such as Prince, Widespread Panic, Bjork, Dave Matthews & Tim Reynolds, along with a host of other live events including plays, and dance performances. 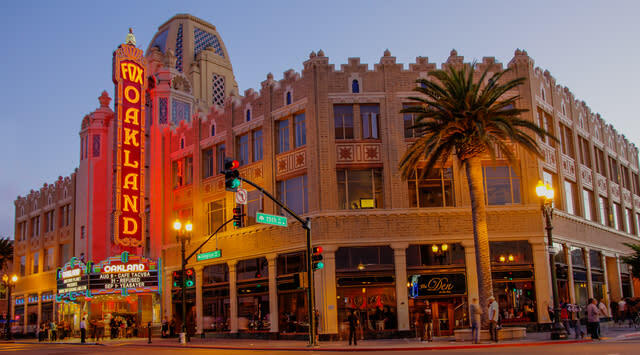 The Paramount is home to the Oakland Ballet Company, the Oakland Symphony, and the Oakland Speaker Series. In paying homage to the theatre’s roots as a “Movie Palace”, classic movies are presented on Friday nights throughout the year. At iconic jazz hall Yoshi&apos;s, dinner is delicious and part of the class-act in the 330-seat venue. The dinner soundtrack, though, is incredible, with performers like Diana Krall, Branford Marsalis and McCoy Tyner playing. The New Parish is a warren of separate bar rooms and upstairs seating areas. On the main stage, you can get pretty intimate with the performers, featuring bands in many different genres including pop, hip-hop, and bluegrass. Shows can be as little as free but are often reasonable at $10. Located in Downtown Oakland, this music venue hosts shows, concerts, events, and parties! They boast multiple floors for different entertainers and have a full bar with reasonable prices in comparison with other concert halls in the area. While the Oakland Metro Operahouse is well known for hosting Hoodslam (an amateur underground theatrical wrestling event) and Tourettes without Regrets (a monthly vaudeville and variety show every first Thursday), they are also home to a variety of other musical performances; Oakland Symphony rehearsals and some of their smaller performances, the New Style Motherlode Dance Company and local band showcases. The kitschy bar of Cafe Van Kleef is entertainment enough when the small stage is barren. The walls in this Oakland institution are covered in a new-form of tropical and worldly objects dart. But the stage lights up most nights with bluesy and rock music. At Awaken Cafe, the whole lotta drinking might very easily be coffee or tea from this hot community-arts nightspot that poses as a cafe during the day. It hosts everything from poetry slams to indie bands. While dinner is winding down at the Basque restaurant, Duende, the upstairs music space heats up on weekends. The calendar includes an eclectic mix of musicians. Fantastic wines from the Bodega downstairs accompany you at the show. Elis Mile High Club is an intoxicating, and dive-y, mix of alcohol, live punk music, and a tattoo parlor upstairs. Somar Bar and Lounge is the perfect location to unwind after work or as a starting point for an evening out in Oakland’s nightlife.The culinary highlight is Couyon Cajun & Po Boys. Because Uptown attracts hipsters and because they have impeccable taste in music--Uptown is the hub for bars with DJs as well as live bands. In the case of Legionnaire, other indoor distractions include arcade games and a jukebox that plays 45s. And a First Thursdays, when the bar hosts punk bands. You might also catch a comedy show or a band upstairs. For beer, cocktails and the indie music scenes, choices are looming in the neighborhood, from Bar Three Fifty-Five and the dive-y Layover to straight-up art and punk rock dive band at The Stork Club. The classy Uptown Nightclub calendar shows off a variety of music from jazz to alternative. It has a top-notch sound system, two mezzanine lounges, and a courtyard. Need a place to crash after a night of music? Book a room at the Oakland Marriott City Center. The jazz-themed hotel has an awesome bar for a pre-show cocktail and is located steps from 12th Street BART.